Some of our favorite dishes pair the highbrow and the lowbrow (see: gourmet ramen or pizza with shaved truffles). So why not take one of America’s truest comfort foods—the grilled cheese—and make it with one of the most decadent cheeses out there? 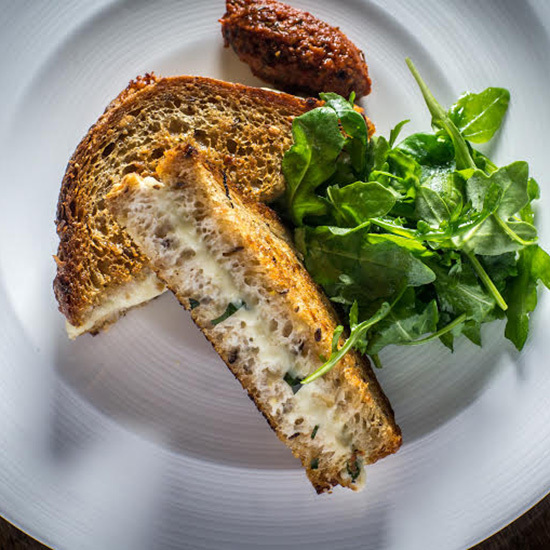 That’s what chef Jesse Schenker does at New York’s Recette, in the West Village, where his brunch menu features a burrata grilled cheese. Burrata, for the uninitiated, is like mozzarella within more mozzarella—a sort of meta-mozzarella. True mozzarella is made from a network of soft, stringy shreds called stracciatella, kneaded together until they form the pliant, melty cheese we know and love. Burrata starts the same way, but a mozzarella casing is then filled with cream and more stracciatella. Cut it open and its soft, creamy innards spill out, even sweeter, creamier and more compelling than the best mozzarella itself. We could easily get distracted talking about burrata. So let’s get back to the sandwich. The Bread: A grilled sourdough Pullman from the Sullivan Street Bakery. The Filling: Perfectly melty burrata and, for the adventurous, bacon or chorizo; all with a house-made romesco on the side.